Thousands of mini dental implants have been placed and studies demonstrate a success rate of greater of than 95%. The entire process consists of a consultation visit to our office with x-rays and impressions being taken. At the next scheduled appointment, your implant(s) will be placed. This appointment typically takes less than an hour and your final restoration is then ready to be completed. 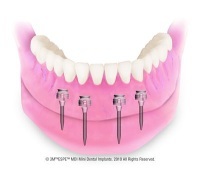 Because the mini implants are so time efficient, Dr. Hisrich is able to perform these procedures at a fraction of the cost associated with the larger old style dental implants. Dental implants permanently replace missing teeth. Implants consist of titanium posts, topped with artificial restorations. The posts are surgically placed in the jawbone to function as a tooth "root.” The posts extend from the jawbone through the gums and are topped with restorations, such as crowns or bridges, that resemble natural teeth both in appearance and function. If Dr. Hisrich determines you are a suitable candidate for dental implants, she will refer you to an experienced, respected oral surgeon in the area who will place the implant posts. After the surgery, the implant posts need to heal for approximately three to six months. During this healing period (called osseointegration) the titanium post fuses with your jawbone to provide a solid foundation on which to place the artificial tooth restoration. Once the implant post has successfully integrated into the jawbone, and the area is healed, Dr. Hisrich will begin work on your restoration. He may suggest placing a crown, or perhaps a bridge, depending on your needs. Dental implants can even anchor a full or partial set of dentures. Nightguards are made for patients who grind their teeth (also called bruxism). When left untreated, teeth grinding can lead to some very serious issues. A nightguard, which is made of clear acrylic, is usually worn while the patient sleeps - that's when grinding happens most frequently. Wearing a night guard will help in protecting your teeth and any previous dental work that has been done (crowns, veneers, etc.) from chipping or breaking.